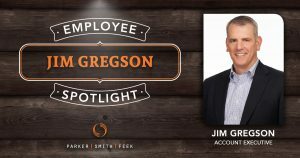 I’m an Account Executive in the Employee Benefits Department and Practice Group Leader for the Professional Services Practice Group. I had two connections through baseball coaches whom I looked up to. They had successful careers in the insurance industry, time to spend with their families, and were really well rounded people; I liked that. If I can follow in Larry Thompson’s footprints- financially secure, having the time to coach my kids, be able to give them a head start in their lives, then I will be a happy man. What’s something exciting going on in the Professional Services industry right now? The economy is booming. Professional services providers support other businesses, so when industries such as tech and construction are doing well, they thrive. So business is successful, but what this really indicates is that the whole region is bullish on the future. Our standard of living is improving every generation, and that is worth getting excited about. “Do what you say you’re going to do.” It seemed obvious at the time, but over the years it has really resonated with me. I have been doing this long enough to know the shortcuts, so to me this phrase means go through your checklists, work the details, just like you would if it was your life’s work, because guess what? It is. Do you volunteer with any organizations or charities? I volunteer with: the Friends of Youth Development Committee, the Overlake Hospital PULSE Council, the Society for Design Administration as Board Secretary, the Liaison to the Lake Washington Human Resources Association Special Interest Groups, and I’m on the Health Economics Committee for the Washington Health Alliance. Why do you enjoy being so involved in your community? It’s encouraging being around other people contributing to society. Seeing people involved in making a difference for our community buoys some of the other stuff you see and hear every day. Driving through downtown Seattle, I am discouraged by the homeless encampments. I don’t have a strong feeling on what went wrong, but if I can help someone from going down that path, literally everyone wins. When you see other people doing even more, it gives me optimism that my kids will inherit a better planet than I did. What’s kept you in the business for so long? It’s fascinating to be on the front lines of this societal debate taking place over healthcare. Is healthcare a fringe benefit or a right? Is the enemy the insurance companies, the pharmaceutical companies, employers, lifestyle choices, or advances in technology? That is a heck of a conversation. There are big challenges, and change is going to be the norm, not the exception. I look forward to a healthcare system that rewards doctors for quality, not quantity. This same system needs to support people who ask “are there any side effects?” and challenges their doctors to deliver results. In return, I believe we as patients need to understand we are responsible for some health issues. If you know you need to exercise more and eat less, own it (guilty!). What’s made you so passionate about the insurance industry? Supporting my clients in something very complex and at times frustrating, is actually really rewarding. We can never forget how high the stakes are for the people and businesses we are working with. From rising costs to decreasing employee satisfaction, employer provided healthcare is at a real crossroads. Navigating the options, whether tax-favored accounts, plans with doctors that are paid based on their quality scores, or asking employees to participate in improving their own health, employers are in a difficult position and I think they really need people like us looking out for them. If your broker isn’t a genuine member of your team, something is off. I’m an introvert. I enjoy gardening and cooking (and to no one’s surprise, eating). Your a big Husky Fan. Why the Huskies? I grew up following the team on AM radio and have great memories of just being a kid. Playing catch with your dad on a sunny fall day and listening to the Dawgs; you can’t beat that. I hope I provide my kids with the same memories. I love being outside. I enjoy all things with my family that involve getting your hands dirty – camping, fishing, hiking, and playing sports. Washington is such an extraordinary place to live, with mountains, lakes, an ocean, and a desert, all within arm’s reach. Hike over Cascade Pass if you want to see one of the most awe inspiring places on earth.